For years people that I have come across always wanted to hear my stories or they would say you should write a book. I have other projects such as films and documentaries and I was going to write a memoir when I retired. Elsa Peretti really encouraged me to write the book sooner I thank her for her support and I am glad that I did being most of my friends are dead she's still alive to read the book and enjoy the journey. My Stars Are Still Shining by Amina Warsuma is a moving memoir with powerful lessons on what it takes to succeed, a story of grit, focus, and determination. Follow Amina’s journey from humble origins into the spotlight and learn how she got to interview celebrities and strut the fashion catwalks. All Amina wanted was to succeed as a model, but this isn’t something that just happens because we want it. She quickly learns that the path she’s chosen is filled with challenges and she faces them with unusual courage. In this memoir, she shares her journey with readers, revealing moments and encounters in her path to achieving her dream, and bringing in stories with people like Elizabeth Taylor, Karl Lagerfeld, and Michael Jackson. While this memoir tells the story of a successful model, it offers readers glimpses into the world of glamour, allowing readers a closer look at some of the famed artists and fashion designers. Amina Warsuma writes with great clarity and she makes her characters come alive, including those she’s known from childhood such as Miss June and Billie who lived in Mobile, Alabama. Although this is a memoir, it’s a gripping story that inspires while providing great entertainment for readers. I enjoyed the grit and how the protagonist’s personality comes out through the narrative. The writing is gorgeous and perceptive, loaded with insights on life, purpose, and success. 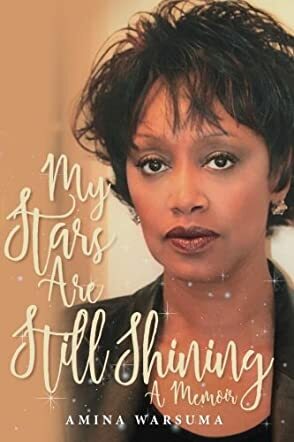 My Stars Are Still Shining is a ride you will want to take, a skillfully written memoir with vivid settings, emotionally charged moments, and a lot of entertainment. As you read from page to page, you also get a strong idea of turning your own challenges into great opportunities. A great offering, indeed! My Stars Are Still Shining by Amina Warsuma is a memoir written by Amina, describing her own life journey to this point. My Stars Are Still Shining is written in a raw, gritty style that does not hold anything back and offers Amina’s honest perspective on life and people. The book begins with Amina talking about her background, the people in her early life that had the most impact on her life and raised her, her biological mother who abandoned her and their troubled relationship, dealing with sexual abuse and a world where drugs and alcohol were freely available, her career as an international model, men and relationships, being a single parent, her relationship and friendship with Michael Jackson, and so much more. My Stars Are Still Shining is an engrossing memoir and takes one through many different worlds, each different from the other. Growing up in poverty in Harlem, NY where Amina spent a lot of her early years, she gives a glimpse into the life of blacks in those days, the mass migration from the south towards cities like Chicago and New York, and the condition of blacks in the south. At the same time, she also talks of getting her first taste of wealth and her subsequent rise as a model where she left her days of poverty and violence behind. I also loved reading about her deep friendship with Michael Jackson, and she talks honestly about who he was as a person and the person she knew. The writing is compelling and candid and makes for a very interesting memoir which I would recommend. My Stars Are Still Shining by Amina Warsuma touches upon her life as a fashion model, her career as a celebrity interviewer, and the rough path which led her there. Warsuma not only talks about her struggles, she also talks about New York City and Harlem between the 1940s and the 1960s, and the American south in the last one hundred years. This story features harsh and heavy subjects, but it should be expected in a memoir. Memoirs are really difficult to read and review because it is an intimate story attached to a real human being and their struggles. To note, I was vaguely aware of who Amina Warsuma is because of the Battle of Versailles Fashion Show in 1973. She was one of eleven black models featured in the show and at the time it was revolutionary. So I was immediately drawn to this book. When I read My Stars Are Still Shining, I couldn’t help but want to share how it made me feel. There is a very rich ambiance to Warsuma’s writing; her story is written in a way that makes it seem as though she’s actually with the reader, speaking the words she has written. Aside from that, the subjects she covers and the things she’s been through, both the bad and the good, are so dumbfounding that I often found myself taken aback, thinking, “How could one person do this?” The simple answer: with perseverance and strength. My Stars Are Still Shining is an unforgettable and awe-inspiring memoir.